Forestry scientists have found a way to arrest the development of flowers (a.k.a. catkins) in poplar trees, paving the way for controlling the unintentional spread of engineered or non-native tree species. With this method, researchers raise the possibility of developing trees as crops for biofuel and other industrial purposes while preventing them from spreading to nearby forests. 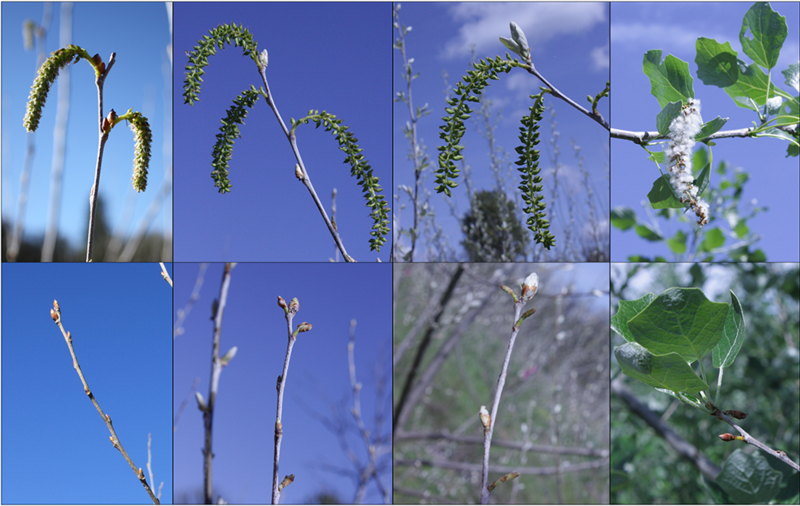 Buds and flowers, also known as catkins, of wild and modified poplars were examined in the field. Branches were photographed in the field in a sequence on the same dates (starting from left — March 12 and 21, April 1 and May 1, 2014). The top row show catkins from wild trees in the field. The bottom row shows buds and flowers from the strong RNA inference (RNAi) trees. Note the small size and delayed opening of these flowers. Klocko is the lead author of a paper reporting the results of more than a decade of research at Oregon State and recently published in Nature Biotechnology. She and her colleagues used a technique known as RNA interference to suppress a gene that plays a central role in the development of flowers in poplars and many other plants. The gene, which scientists call LEAFY, is still present in the trees, but RNA interference (RNAi) acts like a brake to slow down the gene’s activity. The hybrid poplars at AHB’s demonstration sites are not genetically engineered. These poplars were bred using traditional techniques of controlled pollination. As a poplar-based biofuels industry develops, tree breeding programs will expand. For example, the industry may want to develop more drought resistant trees that can grow on land unsuitable for agriculture. Improved drought tolerance can be achieved either through traditional breeding or by genetic engineering, though only traditional breeding is used by the current poplar industry. The sterility technology could be incorporated into the creation of drought-tolerant trees, thus greatly reducing their potential gene flow to wild or plantation trees. Dormant buds collected in the field for initial examination in the lab. 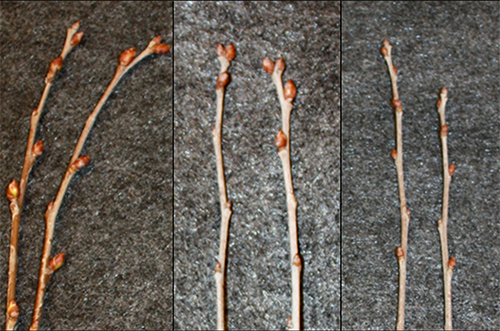 From left: buds from wild (control) trees; buds from an RNAi tree with a normal appearance; buds from a tree with strong RNAi (note the small size of the buds). 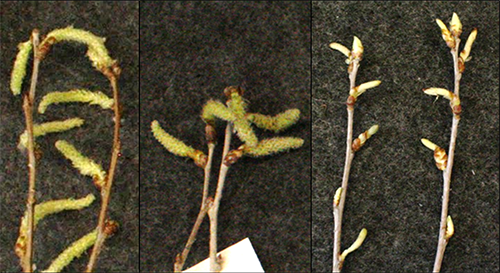 Dormant buds opened into catkins in lab conditions, allowing scientists to pre-screen for trees with altered flowers. Starting from left: catkins from wild (control) trees; catkins from the normal RNAi tree; catkins from a strong RNAi tree. Strauss, Klocko and their team are analyzing tree growth rates and other characteristics to see if slowing down LEAFY has consequences beyond flower development. Their data show that the trees are identical in appearance and do not differ in growth rates from unmodified trees. “There is no question that advanced genetic engineering methods, used responsibly, can increase productivity and sustainability of plantations, but the question of when and if to allow gene dispersal is a real point of contention for both scientists and society. We hope this technology helps us to get beyond this longstanding concern,” Strauss noted. Support for the research came from the USDA National Institute of Food and Agriculture (NIFA) Agriculture and Food Research Initiative (AFRI) Competitive Grant no. 2011-68005-30407, the National Science Foundation (NSF), the J. Frank Schmidt Charitable Foundation, and the Tree Genomics and Biosafety Research Cooperative, a two-decade-old consortium of university and tree growing industries based at Oregon State.